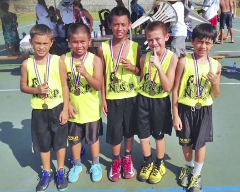 On January 18-19, 208 youths participated in 92 games in the 26th Annual HI-PAL/Hope Chapel 3-on-3 Basketball Jam. 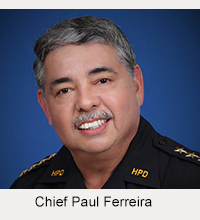 Forty-nine teams from all over the island competed in good sportsmanship with a competitive spirit. 5/6 Division—NSP Gold, coached by Lawrence Kauka. 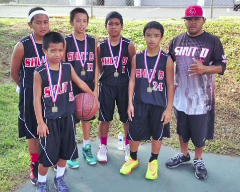 Players: Layden Kauka, Samuel Emeliano, Kahiau Alcoran, Kalia Marquez, Royden Tabiolo, Jason Mandaquit Jr.
7/8 Division—Keaukaha, coached by Jason Mandaquit. Players: Jason Mandaquit Jr., Jaety Mandaquit, Kawika Lions. 9/10 Division—NSP, coached by Reeve Cazimero. 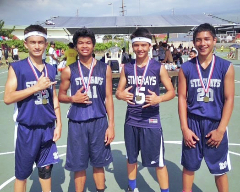 Players: O’shen Cazimero, Koby Agbayani, Laakea Kauka, Jace Hoook, Legend Libron. 11/12 Division—Shut D, coached by Benny Alcoran. Players: Shrew Talley, Howard Robert, Albert Freddy, Micah Hanohano, KJ Walker. 12 & Under Girls Division—Stingrays, coached By Ryan Hanato. 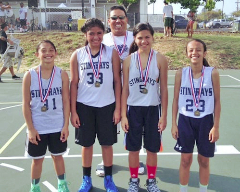 Players: Grace Hing, Caiyle Kaupu, Kianie Medeiros-Dancel, Tanniya Uchida. 13/14 Division—Stingrays, coached by Ryan Hanato. Players: Michael Hanano, John Balo, Austin Ewing, Ka’anoi Kelekolio-Rivera.